What a sad day for Christiana Young and her 5 children. How will they manage without their dad, Othello? I am asking everyone who reads this to say a prayer for this family. This coming Saturday is the funeral. First, of course they need to raise the money. Christiana cannot stop crying. Othello, her husband died suddenly after days of being in a diabetic coma. He will be deeply missed. He was an excellent father and provider. Othello is wearing a brown T-shirt, in the photo. They also have Grandma to care for. Grandma often needs medical help too. This family is very close to us. Christiana is the sister of Felecia (Davis) Wiebe, who we brought over from the Buduburam Refugee Camp in 2007 to live with us. Christiana Jr. (Lemu) the young 13 yr. old girl in the white sleeveless top, is so close to my heart. 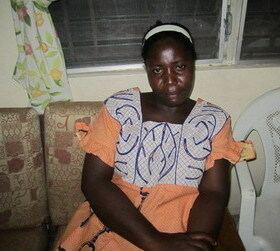 I always have her stay a night or two with me in the Guest House, when I visit Liberia. 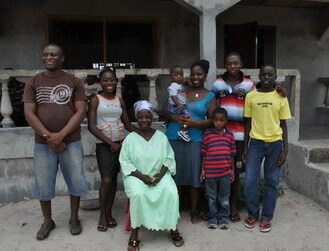 Life is extremely hard for the widows of Liberia. There is no government assistance as there is here. No widow’s allowance, no child support. Any money saved, went towards hospital costs, trying to save Othello’s life. Now they have nothing. If anyone would like to help this family, we would greatly appreciate it. My deepest condolence to the bereaved family.May God comfort them during this time of mourning.